2009 Three Thieves “The Show” Malbec | Wine Splash! We are never sure what to expect when we bring home a Malbec from the store. Many times we are very impressed with the flavors of the wine and other times a bit disappointed. But we are finding more quality Malbecs as time goes on. Winemakers are becoming more experienced and vines are getting more mature and producing much richer fruit. 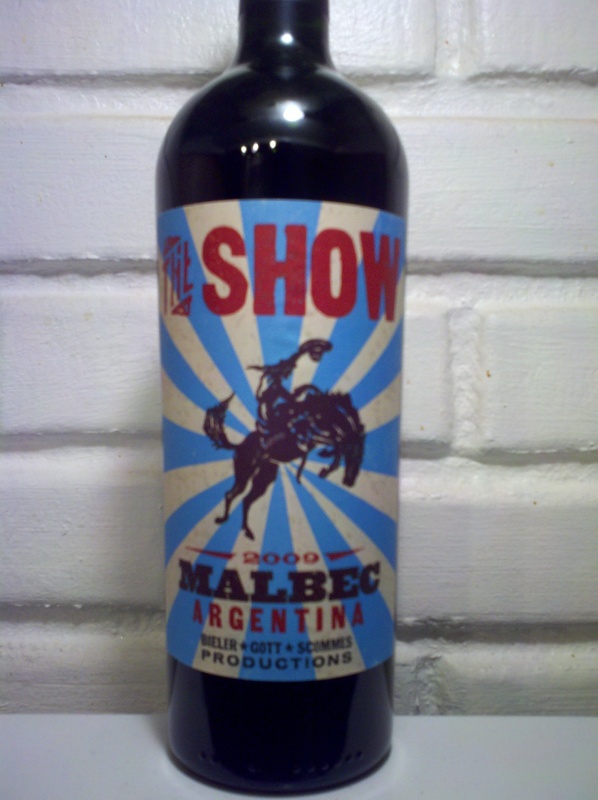 A friend of ours suggested we try “The Show” Malbec and we are glad we did! We love the bucking bronco and bright colors on the label! But we are much more swayed by whats IN the bottle than a bright, showy label. In our glass, the wine was a deep garnet color, almost purple! Aromas of dark fruit, ripe blueberry, vanilla, and smoke. The mouthfeel was full bodied, yet velvety over the palate. It has some nice tannins but not overly tight in the mouth. Flavors of ripe blackberry, cherry, white pepper, and toasty vanilla oak. As the wine opened up a bit more, we detected more spice, earth, and soft floral notes with a nice lingering finish. This is a great food wine and we enjoyed it with baked pork tenderloin. It would also pair well with most barbecued red meats, ribs, pasta with a tomato based sauce, or medium to strong cheeses. We truly enjoyed the 2009 Three Thieves “The Show” Malbec and give it an 88 point rating. This is not a complex wine but there are a lot of flavor profiles going on here. A fairly balanced wine that displays more fruit upfront and lighter tannins on the finish. Overall a very good wine and under $15 a bottle. If you have a 2009 vintage, we would drink it by 2014 since the wine is just now starting to tame. But it is one that we feel you will enjoy. WineSplashing! !